I am livid - after wasting two hours setting up a Webs free website using their piece of rubbish website builder I managed to get one paragraph up. My web browser apparantly struggled to load the program properly disallowing me use of some basic tools. I typed the same paragraph about 5 times, hitting the publish button and then getting nothing upon viewing the page. I am so angry at this point the laptop nearly went through the window. I switched to Internet Explorer 8 which is slower than a crippled tortoise but actually displayed the website builder tools properly. Shame the text looked like it was being displayed by a ZX Spectrum. Bizarre. When I hit the publish button it failed to do anything. Incensed I nearly kicked my whining dog into orbit but refrained and sent her to bed with her tail between her legs and running for her life. Finally I hit the compatability button, hooray the text displayed correctly and the publish button actually published. Although I am grateful for a free website you have wasted 2 hours of my evening - thanks alot you bunch of goons. This site will allow me to organise my stuff and get some different pages set up. The blog will continue here and be linked back to for news updates etc. I can't see me getting on with that website builder. I can post here in moments, by the time internet explorer loads I can be done. 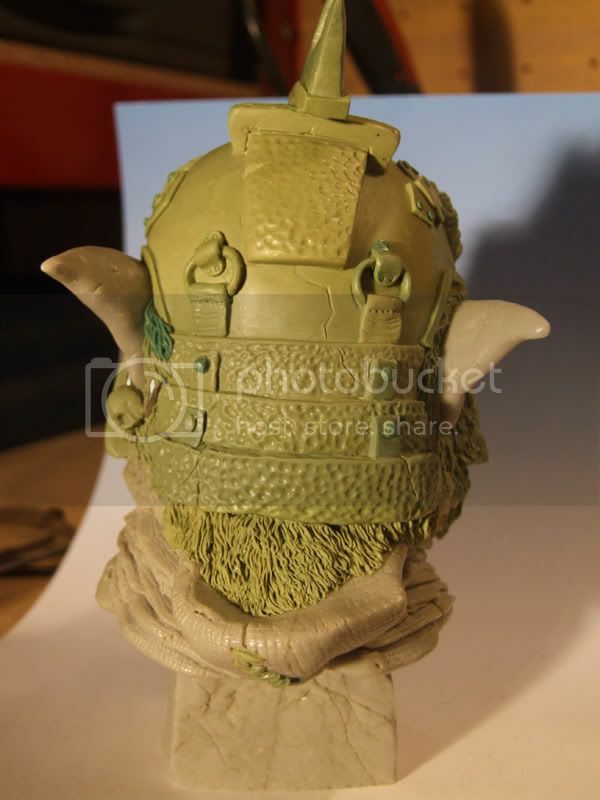 On a brighter note the Rat Warrior bust is on its way to the fellas at Grey Matter Figures to be cast up. Good news indeed, work begins on the new commission. The Rat Warrior is on its way to the casters, so look out for that on www.greymatterfigures.com . A few ammendments and details were done today, some teeth on the skull and a tiny mouth on the worth and some fur tidying up. Here is the artwork for my latest commission piece, I'm currently doing sketches to work out optimum size for the bust to show off the facial details. 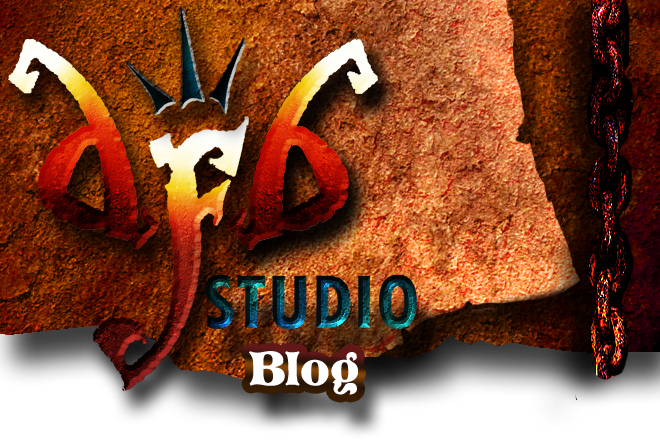 Look out for work in progress shots on here and in the forums. 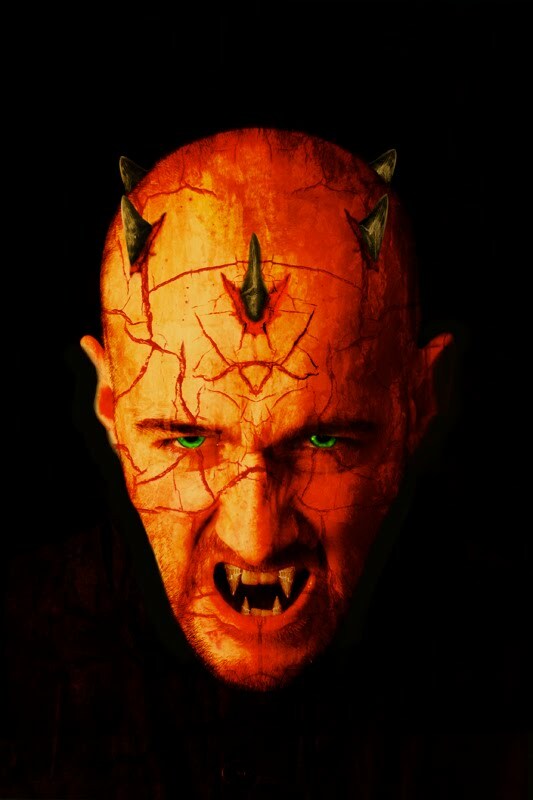 Well, some good news, the commission I was chasing up is still on, so the next project will be of a demon possessed horned character. The artwork is very reminiscent of a Darth Maul character and I hope to capture some strong evil emotion and a penetrating stare in the sculpt. The skin texture will be interesting to tackle to. This should be underway midweek and in progress shots will be posted here and across the forums. The bust will be a limited edition run of 100 and will be available from www.daemonscape.co.uk who sell resin wargames scenery and bases for a variety of scales. They have a great selection of nicely priced gun turrets, emplacements and other pieces, far cheaper than Forgeworlds range. Here are some shots of my latest sculpt, a little more to do on it, but its nearly there. 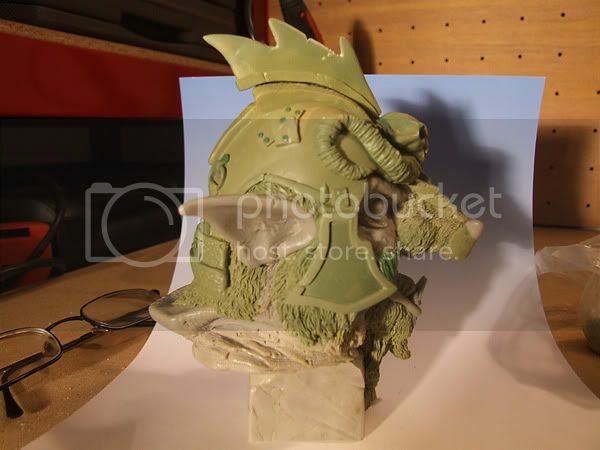 Sculpted with a mix of milliputt and greenstuff onto a resin copy of my super sculpey original. Just putting down some further thoughts on how to organise the direction of my sculpting. My fantasy and science fiction worlds are still very much thoughts in progress and at the moment I am really wanting to get down a name for each setting and a logo design, then I will be temporarily happy with that. I'm starting the ball rolling with the sci-fi world. I thought "After World" sounded quite nice until I googled it and found it already existed along with a very similiar setting and theme that I want for myself. Had to scratch that. My setting will be very much based in this world - we have so much culture already in place it seems daft not to utilise it into a story we are all very much aware of and thinking about constantly - our future. 2012 seems like a good starting point for our Apocalypse, and I'll throw in some alien interference and the chaos that follows from the collapse of society and that should be a good starting point for ideas. The obvious things like food,fuels/power, resources and knowledge are key to survival in a series of reborn city states scattered across the earth and my sculptures will reflect the factions and characters of this new world order. The miniatures will be created with a mind to fit into the vast array of RPG's and wargames out there already. Busts and larger scale figures for collectors will also reflect people from this futuristic dustland. I might create a website and keep up some links to it on this blog so you can check out work as it trickles out a little easier. More work done on the rat warrior. It's nearly there now. I am trying to complete parts on it everyday now and would guess it will be finished within a week or so. 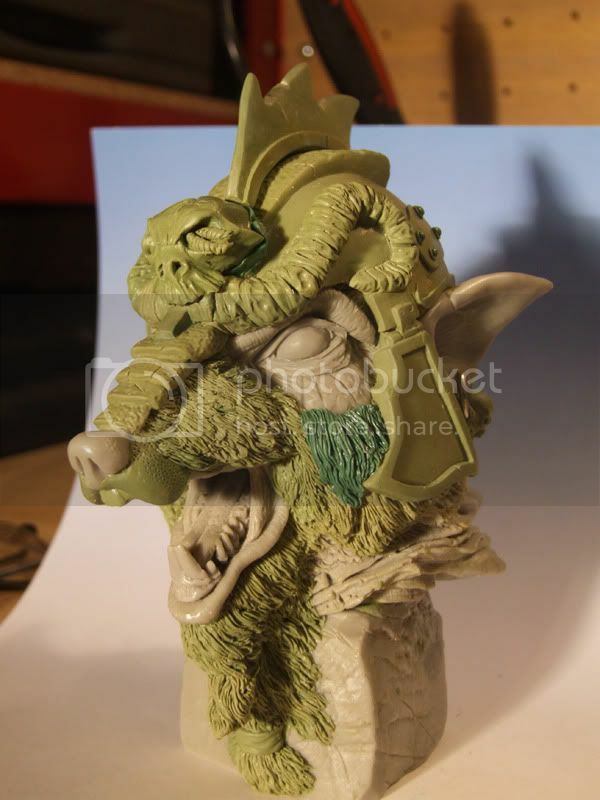 This has been a slow project compared to some of the other sculpts I have done due to various factors and some personal troubles but hopefully I can make quicker progress on the final bust in the series - The Rat King himself! What's next up? Well, more painting on the "In the Shadows" bust and a couple of other commissions to chase up on. I want to get some more personal projects such as my Dark Taeles nursery rhyme characters on the move and another one Legends of Yore (working titles). These are two of my of interests and so it is only sensible to create some sculpture around them!! I have some good ideas, but it is sometimes hard to go somewhere that hasn't been explored before. My Red Riding Hood is bad with attitude, a wolf hunter who is more inclined to say "Oh my what a beautiful fur coat your skin would make!" than talk common niceties. This is obviously not really taking her in a direction that hasn't already been explored but I do love this potential aspect of character and think it works well with her. Where I can, I will push some ideas that are a bit more out there. The Olde world is full of dark and intriguing characters thanks to those Brothers Grimm. The warrior is almost finished, just some details on the side of the helmet, the horn and the cheek guard clasp mainly, some sanding and finishing and the helmet crest left to do. Working with epoxy is certainly slow compared with super sculpey, but I do like the saftey net of not having to worry about damaging it by holding it clumsily and squashing the details. I am pleased with the final look, it is turning out well and think it will be mission accomplished when this piece is done. The scavenger type culture of the were-rats and their look is achieved by creating a slightly disjointed type of helmet, which is worn,damaged and repaired and has a couple of different elements to its design. I neglected to take photos last week, as I'm moving all my stuff into the garage and now the work is largely finished it seemed slightly pointless. I will now do photos when the piece is completed!!! February was not a good month, my grandfathers funeral, my in-laws little dog has died and an illness in the family have kept us all busy. But life goes on and march is off to a good start with the completion of my workshop (well near enough, just lighting to sort out and a couple of minor details to finish). A dedicated space for my art work at last! My wife will be glad to see the back of my stuff taking up the room. I have some tools to purchase to kit it out, bench grinder, bench drill (for hopefully creating some useable resin jarheads as well as accurate drilling and i hope to purchase a cheap cnc router later in the year, i already have sourced a very affordable 3 axis cnc. With this tool i should be able to create vehicles and anything else which requires more technical accuracy, press moulds for detailing etc as well as make my own display bases. The warrior rat has some minor work done, one side of the face is complete and now I am moving to detail the other side of the helmet, hopefully this should go a little quicker as I now just have to mirror what i have done. I am pleased with how its turning out, I will be doing a couple of options on the helmets crest piece just to keep things interesting as well.